Vintage women’s double breasted pea coat, midnight blue with brown buttons. Size and brand tags are missing, measurements are consistent with a size large. Measurements lying flat: Across Chest: 23” Length: 30” Sleeves length: 22” Plaid lining 2 front slip pockets 1 inside breast slip pocket Brown bottoms Pre-owned in good condition no rips Please review photos for more details. 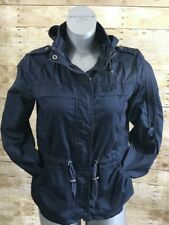 Womens Navy MNG jacket size S. Condition is Pre-owned. Shipped with USPS Priority Mail. In excellent condition. Very nice, warm coat. It is Navy color, even though the pictures make it look black. Condition:Decent condition. The coat could used to be cleaned, there is lint and small amounts of hair about it, we did attempt to remove all of it but a little remains. Shoulder To Shoulder: 17". Beautiful women's pea coat with hood! Navy blue small fitted. Note: line through inside label to prevent return. New without tags! Lacoste Womens Overcoat Asymmetric Navy Blue Jacket Zip. Condition is Pre-owned. Shipped with USPS Priority Mail. Some slight pilling but this is a beautiful, flattering jacket. Purchased at Lacoste in NYC. Double zipper, with pockets. A classic hooded duffle jacket! Material Wool Blend. Color Navy Blue. Length 29". Sleeve 19". Chest 40". Vtg Faux Fur Coat Navy Blue Vegan Winter Sz M. Condition is Pre-owned. Awesome color and style. Vegan fur. Great condition! No holes, stains, or smell. Lining is clean and in good condition. Super warm. Feel free to ask questions and thank you for your interest. Shipped with USPS Priority Mail. Gorgeous blue pea coat with gold buttons. Material is unknown but feels like cool wool - could be polyester/nylon blend as well. It's not a winter coat - more like a trench coat in terms of warmth and thickness. In great condition - no visible sign of wear. The model is 5'-8'' and US 4 for reference. Let me know if you have any questions. Official United States Navy peacoat. Quarterdeck Collection. Women’s double breasted size 12R. I was a Navy Corpsman and required to buy this jacket but barely wore it. Excellent condition. This sailor jacket is a classic and is timeless. Over $150 new. PLEASE MAKE SURE OF YOUR SIZE. I CANNOT GUARANTEE IT WILL FIT YOU, SO DO NOT BUY UNLESS YOU HAVE TRIED ON THIS SIZE AND KNOW THAT IT WILL FIT YOU. GOT TO A BASE EXCHANGE AND TRY IT ON FIRST!!!! 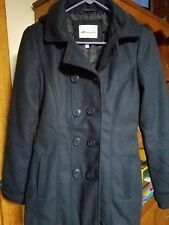 H&M Womens Navy Double Breasted Peacoat Sz 10. Condition is Pre-owned. Shipped with USPS Priority Mail. Gorgeous Pea Coat. Listed as pre-owned, but I don't think I ever wore it. All my clothes are this way. Double breasted, slash pockets, perfect length. 100% wool which is so rare at this price. Used but in great condition, no flaws. Womens Double Breasted Navy Wool Coat. Condition is Pre-owned. Shipped with USPS Priority Mail. This is a Maison Kitsuné Double Breasted Wool/Poly coat. There are no defects or flaws. This coat has a size of US XS BUT I wear a US size L and this fits me a little oversized. I believe it was meant to be a very exaggerated looking coat. Measurements of the coat when laid flat are 24 inches pit to pit, about 23 across where the belt ties, and a little over 31 inches from the shoulder to the bottom. I wear a 36D, 29 in jeans, L in tops and coats and this still leaves me with a very roomy fit! It is incredibly well made and retailed at around $800 when it was new a couple years ago. I have only seen it available on one European site and is sold out everywhere else. I am listing it lower than this site! Message me for any questions or more pictures! Banana Republic Wool Lined Coat, Navy, 4. Condition is Pre-owned. Shipped with USPS Priority Mail. navy dark blue double breasted womens jacket. never worn no damage besides little scrape on paint of button. navy blue with gold colored buttons and accents. long sleeve collared jacket. ends mid thigh. for a smaller person, probably equivalent of womens dress size 2 or 4. This coat is gorgeous the gold buttons add a great touch to the navy peacoat. All buttons are in tack, the pockets needs to be re-swelled. Navy Guess Coat Medium. Condition is Pre-owned. Shipped with USPS Priority Mail. PRODUCT DETAILS BY J CREW The perfect peacoat for spring. Inspired by a vintage silhouette, it has a boxy-ish fit and comes in heavier-weight twill for just enough warmth. HAS A SPOT ON FRONT, see pics Size14 Cotton. Pockets. Machine wash. Import. Item G2009. NWT ALPHA Industries Lux Wool Cashmere blend structured Peacoat Collette Medium dark Navy. Condition is New with tags. Shipped with USPS Priority Mail. Navy Peacoat from American Eagle. Features two front pockets with button closure, 2 smaller pockets on front, 8 buttons on the front of jackets, 1 interior button, plaid lining, nice collar. This jacket is used and is missing the detachable hood and one button on the pocket. Wool is in great condition, no holes, tears, rips or stains. Smoke free home. Authentic US Navy Pea Coat Womens Overcoat Size 40L FAST FREE SHIPPING!!! Style: G2009. Item G2009. Nwt Jcrew Petite peacoat in heavyweight cotton twill. "The perfect peacoat for spring. Spring 2017! PRODUCT DETAILS FROM JCREW THIS SALE IS NOT AFFILIATED WITH JCREW. 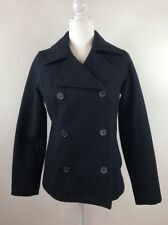 Beautiful Long Navy Pea Coat Sz 2-3x. Condition is Pre-owned. Shipped with USPS Priority Mail. Newly Dry Cleaned!!! White top not included- for display purposes. Something Navy Teddy Long Coat Blue Brunnera M NWT. Condition is New with tags. Brand new with tags blogger favorite ! texture and sophisticated work-to-weekend charm. 46" length (size Medium) Notched lapels Long sleeves Side slant pockets Lined 100% polyester faux fur Dry clean Shipped with USPS Priority Mail. US Navy Pea Coat, worn during active duty 2000-2005. Coat is wool, not sure of lining. US Navy Peacoat Overcoat black double breasted DSCP Quarterdeck Size 18L by Sterlingwear of Boston. Featuring Anchor buttons. Condition is Pre-owned. Abercrombie And Fitch Navy Blue Wool Peacoat. Condition is New without tags. Shipped with USPS Priority Mail. Peacoat style, possibly a handmade item. Cozy and understated for a faux fur piece. Saw this item and fell in love. Why aren't you buying this!?. 32" length. Material: 35% wool, 45% polyester, 5% nylon, 15% other fibers. Pit to Pit-19" Length-40" Sleeve-23". Care instructions: dry clean only. This is a great jacket/coat, not too heavy but warm. Lady’s size 6, Calvin Klein pea coat with toggle buttons and wonderful detail. Inside is lined in navy blue to match navy blue exterior. Wool, dry clean only. I wore this once. Hood can be removed with just unfastening a couple buttons. There is a tear in the brown material around the second button down on front. I recently put in dryer to fluff after moving and it got too hot hitting that one spot. See the up close pic for detail. Otherwise in great shape. The flaw blends in given it is a dark color against another dark color. Smoke free home. This L. L. Bean women’s navy blue corduroy jacket is a size medium, has double breasted buttons, with a belted waist. This jacket measures approximately 16” from shoulder to shoulder, 20” from underarm to underarm, 24” arm length, and 30” from top to bottom. This jacket has two outer pockets and comes in good used condition, with some signs of use and wear. Please see photos as they are part of the description.